Ready in 2 mins. Genuine goodness. Gluten free. Free from artificial colours, flavours and preservatives. Suitable for vegetarians.Our Classic Grains have been selected to help you create delicious and wholesome meals in minutes. 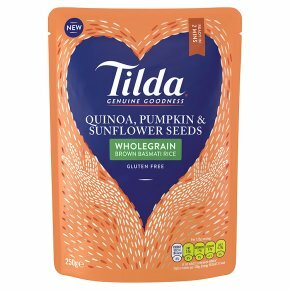 This delicious blend combines our nutty and nutritious wholegrain Basmati grains with the goodness of quinoa, pumpkin and sunflower seeds. Why not try... Add herb and chopped vegetables for a quick stir fry. Stir through flavoured oil, cooked chicken, mushrooms and tomatoes.